Stuart Le Noury walked to his third overall win in the annual Church to Church walk over 19.4 miles in a walk sponsored by ABN-AMRO Channel Islands Ltd. His winning time of 3 hours 11.24 was his second quickest time and walked in conditions that grew hotter as the race progressed. Out on his own and unchallenged throughout the walk he had built up a lead of almost 5 minutes by the 4 miles point at the airport after walking from the South Esplanade and up the twisting hills and lanes via Cornet Street and Les Vardes, passing St Martins Church on the way through. Rob Elliott had settled into second place and walking steadily had a lead over third men Phil Lockwood and Ian Torode, a visitor in his first Church walk, of nearly four minutes at the same point. Leading woman Wendy Wilson passed by in 49 minutes with a 50 seconds lead over Ana Sahati. The expected leading woman Donna Allan, the Sarnia Walking Club Champion, was sidelined and had to be a frustrated spectator on doctors orders after an untimely recent visit to the hospital. After walking on to Torteval and through the ups and down hill sections to St Peters and St Saviours, Le Nourys lead increased as he passed the ten miles point at Les Vauxbalets in 1.35.45. Elliott, as last year hit that distance in a shade over 1 hour 50 minutes but was to soon start struggling with his pace noticeably slowing soon afterwards. 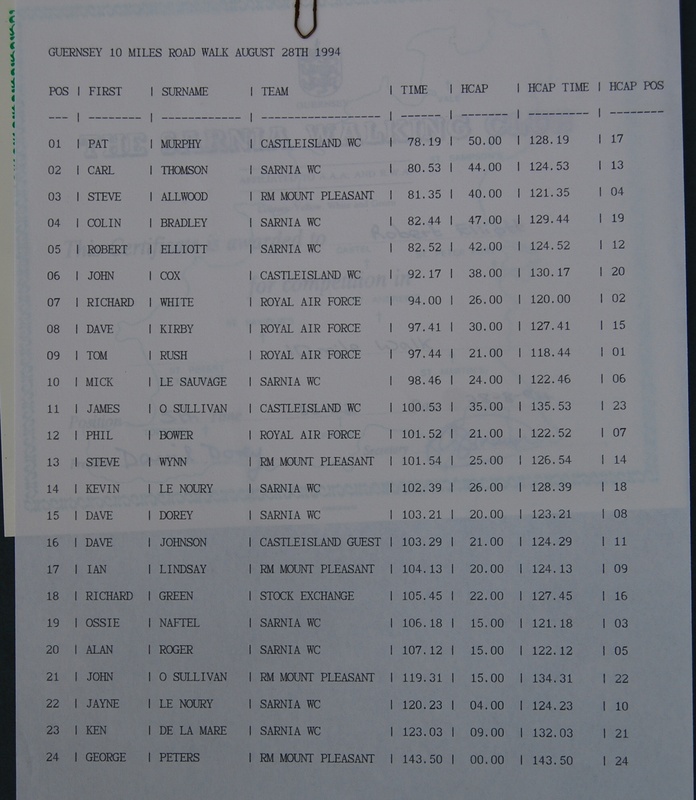 Other competitors were relatively close together with local Phil Lockwood, Ian Torode and Glyn Jones all in with a chance of third place going into the final miles. Stuart, still well in control went through 15 miles at the Vale Church in around 2 hours 22 minutes and only slowing slightly claimed a convincing victory back in St Peter Port after negotiating the crowds at the Sea Front Sunday and on to the finish at South Esplanade. Elliott was still walking at his reduced pace as he glanced at the clock at Vale Church showing around 2 hours 50 minutes, thinking back to the days when he would reach the finish in that sort of time. As conditions got hotter the walkers were sorting themselves out with Glyn Jones from Coventry Godiva, with a few Church walks under his belt claimed third place in 3.48.46. A couple of minutes behind was Ian Torode, a race walker from the south west of England, who held off Phil Lockwood by another few minutes. Stephen Cartwight, another first time competitor from Colchester and Tendring finished in 6th place in 3.55.23, ahead of regular visitor Sean Pender from Enfield in 3.57.27. 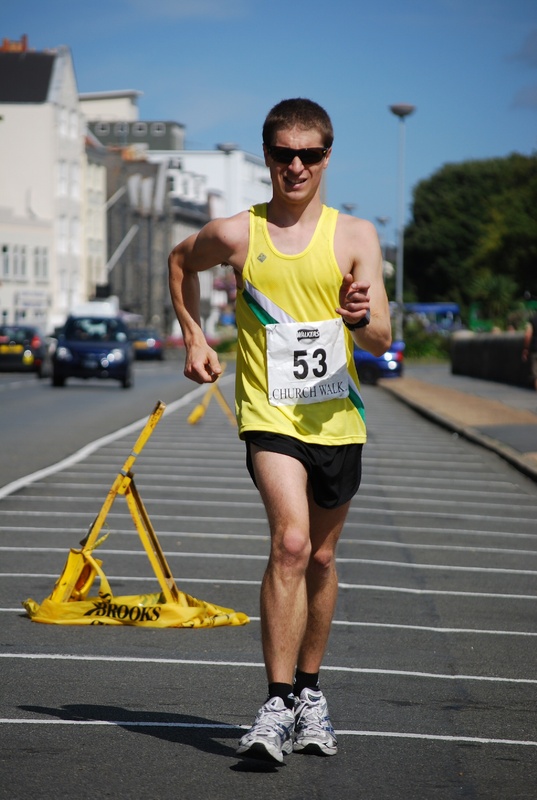 Past winner and another regular walker to Guernsey events, Ed Shillabeer added another finish to his total with his slowest time in the walk, finishing in over 4 hours for 9th place. His best time was a winning 2.40.58 back in 1989. Ed recently walked for 11 hours in a 24 hours walk. Isle of Man walker, now working in Guernsey, John James Cooper finished in 4 hours 21.05. It was his first Guernsey walk but he has completed the Isle of Man version of the Guernsey race three times, with their distance being much further at 85 miles. Regular visitor David Hoben struggled in the closing stages but crossed the line for another finish in 4 hours 36. Less than five minutes behind was first local woman Ana Sahati with a winning time of 4.41.25. Second woman was regular local walker Wendy Wilson, walking much further than she has done before and struggling in the second half of the race. To her credit, she held on to finish as second woman in 4.56.41 and now has a trophy to show to her father Roger Brehaut who walked to second place in 1955 with a time of 3 hours 27 minutes in front of a big crowd at the finish. Today saw the end of a competitive streak by stalwart Kevin Le Noury. He first walked the event back in 1976 and was a winner of the Victory Cup for the first Channel Islander to finish back in 1987 and until today was an ever present on the start and finish line. Today he was officiating. In wet and windy conditions throughout the race Jonathan Hobbs raced to his third win in the annual Church to Church road walk held in Guernsey with a new personal best time of 2.57.36 for the 19.4 miles course. This beat his previous best time set when winning in 2013. The youngest walker in the small field of 13 starters showed no ill effects after racing last weekend in the Guernsey marathon and finishing in third place. His nearest challenger was newcomer to the race and past Olympian Ian Richards who at 69 years old still takes his race walking seriously and prepares accordingly. After his short and fast 3 kilometres in Guernsey two evenings earlier he was obviously in good form. From the off these two soon set themselves apart from the rest of the field moving from the coast at South Esplanade and up the hilly miles in the St Martins lanes before flattening out towards the airport and the 4 miles point. Heading towards Torteval Church Ian Richards had established a lead of thirty three seconds at the 5 miles point with a time of 45.39 with Jonathan Hobbs chasing. Already well behind, past winner Jim Ball and Chris Hobbs, father of the second walker, went through in around 54 minutes in third and fourth positions. Local walker and another past winner Rob Elliott had toed the line for the first time in 15 years, after spending those years officiating. He went through looking relaxed in just over 55 minutes. The next 5 miles moving through Torteval, St Peters and towards St Andrews saw a change at the front as Jonathan Hobbs with an increase in pace created a gap on Ian, passing through 10 miles in 90.30 with an almost two minutes lead. Jim Ball was still in third place in just under 1 hour 40 mins. First local Rob Elliott was still walking well and was satisfied as the clock showed him recording another 55 minutes 5 miles section. Holding his pace well Jonathan was still increasing his lead, mastering the climb up Monnaie at 11 miles before hitting the long downhill section at Castel Church. Ian Richards was finding it hard on these stretches but his position was solid with third man Ball well behind. Unlike during his previous two wins when Jonathan had the close company of Jason Le Noury at 15 miles, on this occasion he only needed to concentrate on walking the lonely road to the finish having created a big lead. Elliott was still moving well through St Andrews and Castel and unknown to him was making inroads on Chris Hobbs as they moved along the Friquet and then towards the Vale Church. He has his first glimpse of Hobbs around 14 and a half miles but although the gap closed in the final miles Rob Elliott was still content to walk at his own pace and not push on to chase. Still holding his 11 minute mile pace Elliott was timed at 2 hours 45 minutes at the Vale Church 15 miles point. Climbing up the hill towards the 16 miles and then down to St Sampsons harbour the gap remained. Moving from the calm of Grandes Maisons Road, the walkers were hit head on with a strong wind all the way to the finish line at South Esplande, some two miles away. A glance behind from Chris Hobbs as he turned on to the seafront and he knew Elliott was close but not close enough. Both walkers were probably walking at the same pace by now so the gap remained as Hobbs finished fourth in 3.36.20 and Elliott fifth in 3.38.09. Rob scored another victory for first Channel Islander home winning for the 18th time and 40 years after his first win as an 18 year old. He commented that it was a shame that such a time today, which was one of the slowest winning times, could still win the trophy. An isolated Jim Ball had finished third some 15 minutes earlier in 3.20. Past winner Ed Shillabeer and long distance specialist finished in sixth place in just under four hours, but let out a yelp of joy when told that Ian Richards had just fallen short of his age best time set in 2006. Sean Pender finished a couple of minutes down on Ed, whilst regular visitor David Hoben just held on to beat second local Peter Beckerleg. Stalwart Kevin Le Noury was less than a minute behind, completing his 42nd consecutive Church to Church and third local home. Next home in a new personal best time by over a minute was Kay Coulson, the new womens champion and Star Trophy winner in 4.16.59, followed by Andy Walker in 4.35.15. Kay still had a smile on her face even after facing the tough conditions that lasted throughout the day. Thanks from the Sarnia Walking Club go to all the marshals and helpers that stood around in the rain as well as to all the events sponsors. 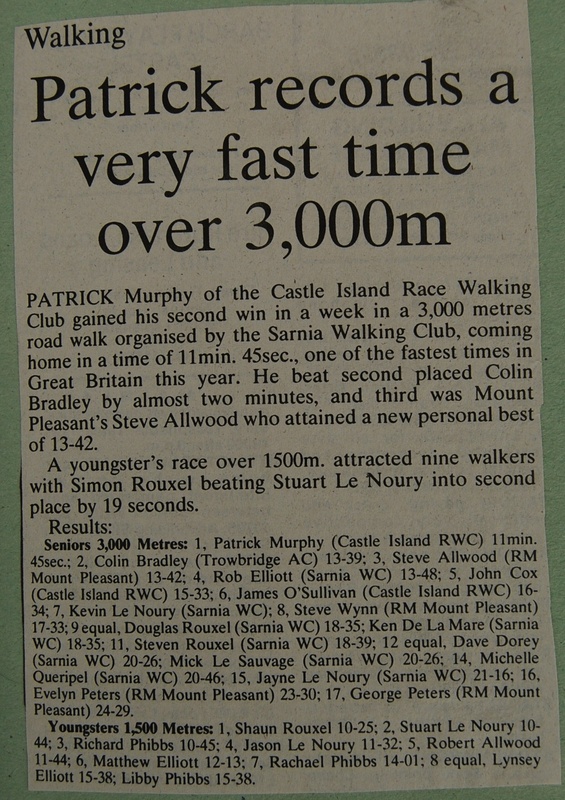 The local Guernsey Press featured race walker Rob Elliott bringing back some memories of his race walking career. For those that know Robs father Mick, he is still alive and well and not as indicated in the article. 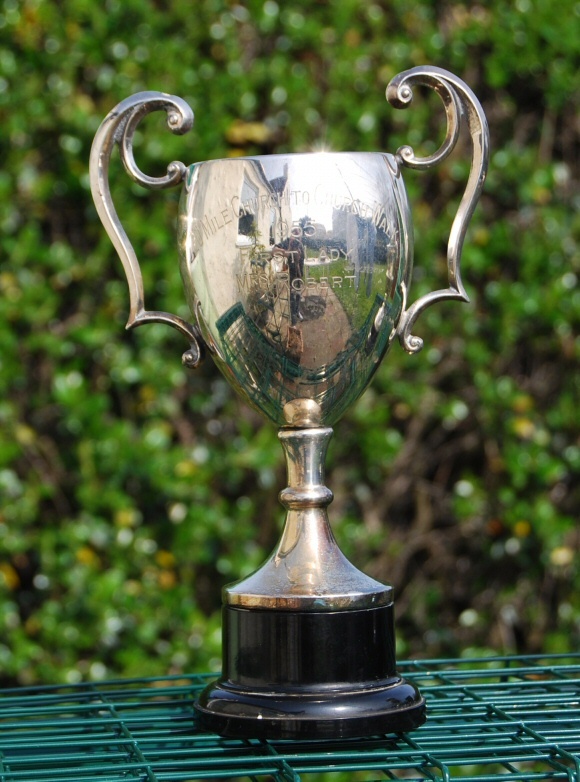 Also a feature on the Guernsey Church to Church trophy given to the first male Channel Islander , namely the Victory Cup. Newly weds Stuart Le Noury and Olga Sinkevica, the Sarnia Walking Club Heritage Group Champions for 2016 missed the final race over one mile as they were on honeymoon, letting in brother Jason and Marie Macdonald to take the respective victories in the final walk of the series. Stuart Le Noury again wins the Sportsman Trophy as Champion with 2nd placed Phil Lockwood taking the Grace Mansfield Endeavour Trophy. Olga Sinkevica wins the Carol Bates Memorial Championship Trophy retaining her title from 2015. Junior Under 17 walker Alex Sinkevics wins the Junior Championship for the year. Jason Le Noury walked away from the field to win easily in 7.31 from Phil Lockwood, whilst Marie Macdonald in 10.27 raced to a new Guernsey womens age best time, ahead of Jayne Le Noury. Jayne Le Noury won the Jubilee Tankard for the handicapped section held in conjunction with the Championships with 89.5 points, ahead of Kay Coulson with 80 points and the first man Mick Le Sauvage. The next race is on Sunday August 21st at 9.30 am for a 3 miles road walk on the Rocquaine Bay Circuit, starting at the Imperial Hotel and finishing at the Rocquaine coast road car lay-by. Only a few weeks after that is the annual Church to Church road walk over 19.4 miles on September 4th starting at 9.00am. It is hoped for a close walk between the womens Church Champion Marie Macdonald and 2016 Club Champion Olga Sinkevica, now Le Noury. Stuart Le Noury the reigning mens Champion can expect the close attention of visitors Jim Ball, himself a past winner and newcomer to the event Sam Fletcher from the Isle of Man. Added to the mix could be Jason Le Noury who has raced sparingly this year. 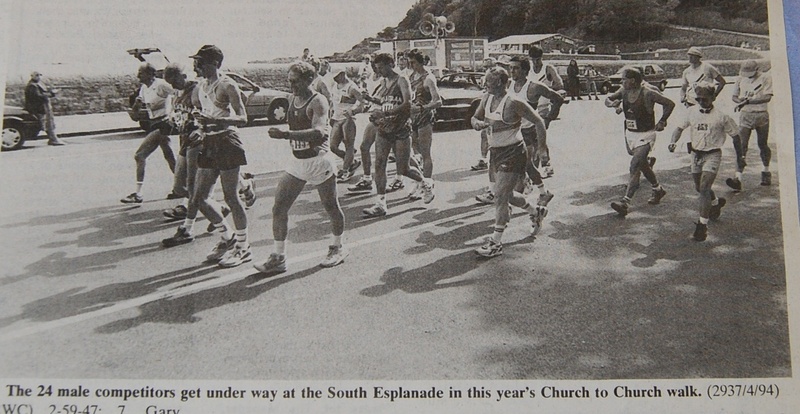 In response to a recent comment from Joseph Malone on the Church to Church website, I was prompted to go back in time to the early 1990`s (results here) when walkers from Eire and the Castleisland RWC took part in Guernsey walks. The SWC received a phonecall from a walker from that club indicating they would be over for the Church to Church walk. A lot of information as to names may have been lost in the telephone conversation with a broad Irish accent talking to a Guernsey one! In these pre internet days I had looked through old athletics magazines etc to find any Irish walkers names to see what sort of competition would arrive. Church walk morning arrived and two Castleisland walkers were at the start. 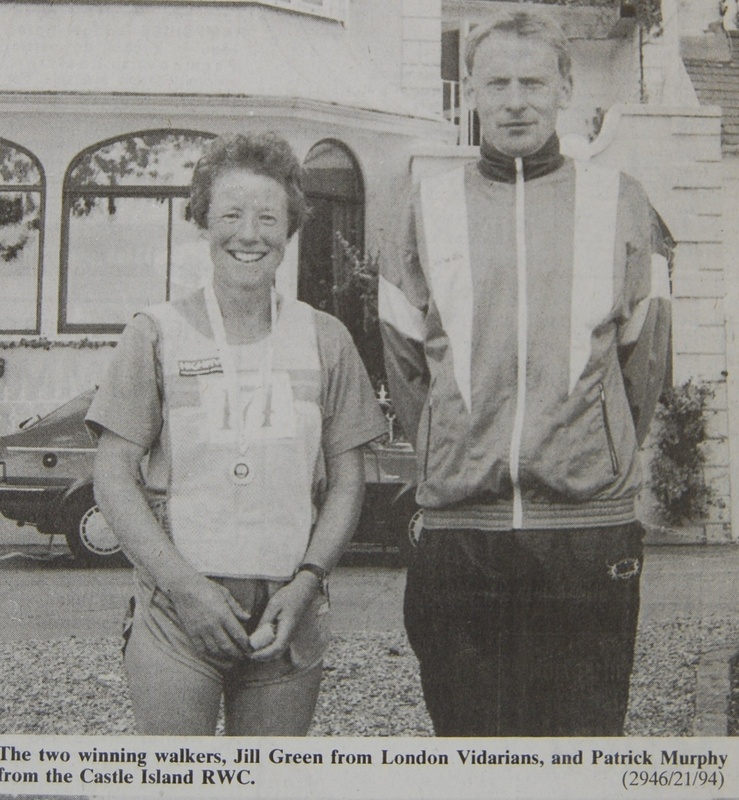 Patrick Murphy (No 44 in photo above) and James O`Sullivan were duly introduced and then we found out that Pat was of International standard with a sub 90 minutes 20 kms to his name as well as 4 hours 23 in his debut walk at 50 kms. Straight away we knew he was the favourite for the Church to Church 1993! Pat Murphy walked strongly and romped home an easy winner in 2.33.00 for the 19.4 miles course, going through the 10 miles point in 78 minutes to go to third in the all time rankings for the event. Colin Bradley was an isolated second some 17 minutes behind. Local walker Rob Elliott was fourth in 3.08.48, but held on to his second place in the all time rankings, with his best time set eleven years earlier. A year later and John Cox from Castleisland (in photo finishing Church to Church) joined the two walkers from the year before. They competed three times whilst in the island. Once over 10 miles the Sunday before the Church to Church, a 3 kms road walk on the Friday before the Church and the Church itself. But they made things difficult for themselves. The evening before the 10 miles and a phone call from them to say they were on the way to Guernsey fromFranceand no idea when they would arrive! Problem. The race was due to start at 10 am. Problem. There were two boats due in to the island fromFrance early to mid morning and we had no idea as to which one they were on! Problem solved. I went to the harbour to wait for the arrival of the first boat and hope they were on it. As luck would have it they were and we could get straight to the start which had been put back an hour in anticipation of their arrival. In this pre mobile time, I was communicating with club members some seven miles away at the start via a phone box at the harbour and one almost on the start line! A quick drive to the start, putting on numbers and racing kit whilst in the car, saw them ready to roll. There was no time for warm ups as other walkers had already been kept waiting at the start, so 25 minutes after arriving they and the rest of the walkers were on their way walking from Imperial Hotel to Lancresse. Pat Murphy easily won in 78.19 from Guernseywalker Carl Thomson in 80.53. John Cox walked 92.17 and James O`Sullivan 100.53. Once settled in Guernseyand staying within a mile of the 3 kilometres course, things were a little bit more relaxed for their second race. Pat Murphy blasted out an 11.45 time for the two lap course, with John Cox recording 15.33 and James O`Sullivan 16.34. Murphy repeated his Church success of the year before finishing in 2.34.25, John Cox finished 8th in 3.17.34 and James O`Sullivan 9th in 3.19.12. Six walkers broke the three hours barrier, Murphy winning from Colin Bradley 2.49.28, Carl Thomson (Guernsey) 2.52.59, Rob Elliott (Guernsey) 2.53.52, Steve Allwood 2.59.12 and John Paddick 2.59.47. 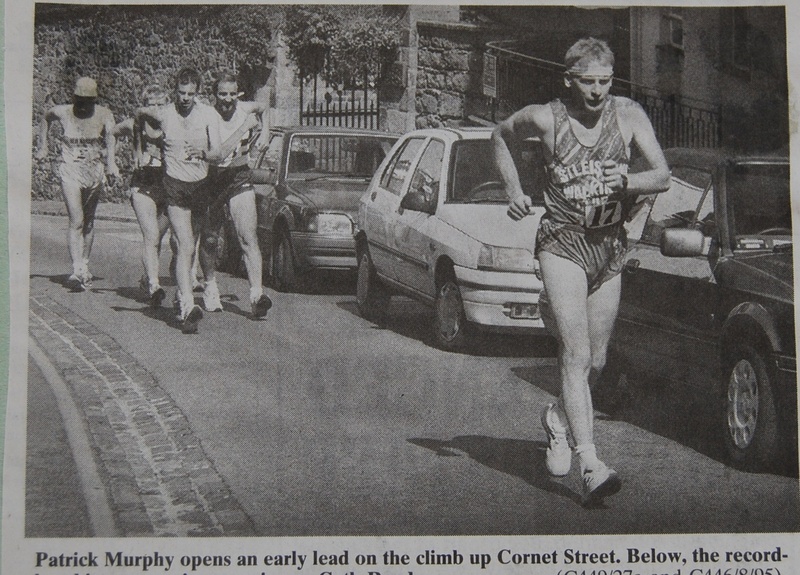 Pat Murphy walked to his third victory in 1995, slowing down to 2.39.25 with team mate Joe Malone, in his only walk on Guernsey to date in fifth place in 3.18.27. Local Guernseywalker Rob Elliott was second in 2.49.11. 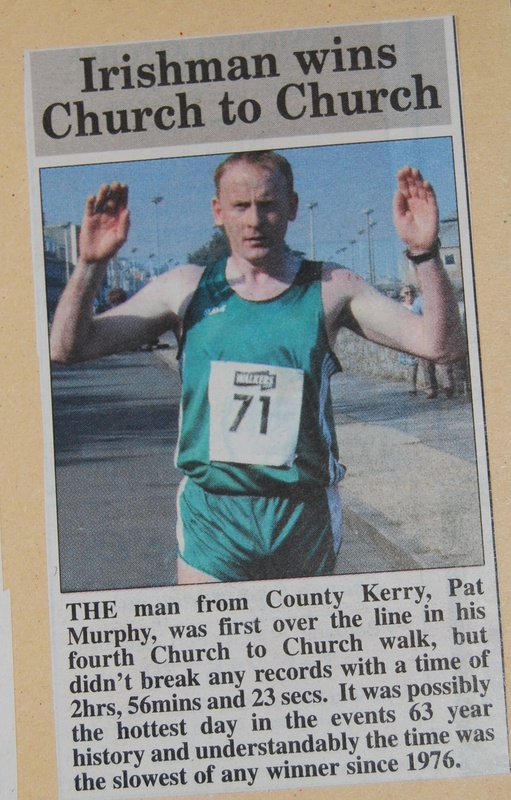 Pat Murphy raced to his fourth victory in 1999 on a stiflingly hot day in 2.56.23. 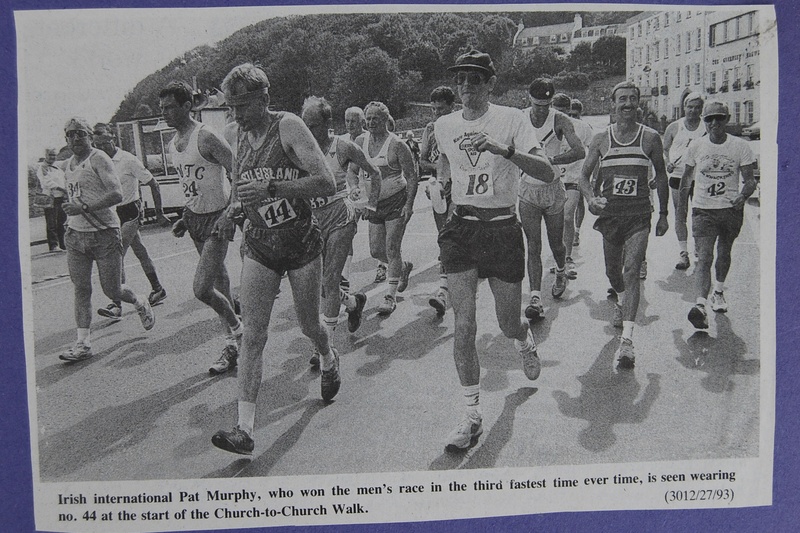 With four wins out of four starts Pat Murphy is one of the most successful ever Church to Church walk competitors and even to date has the 4th fastest time as well as three performances in the Top 12 times. 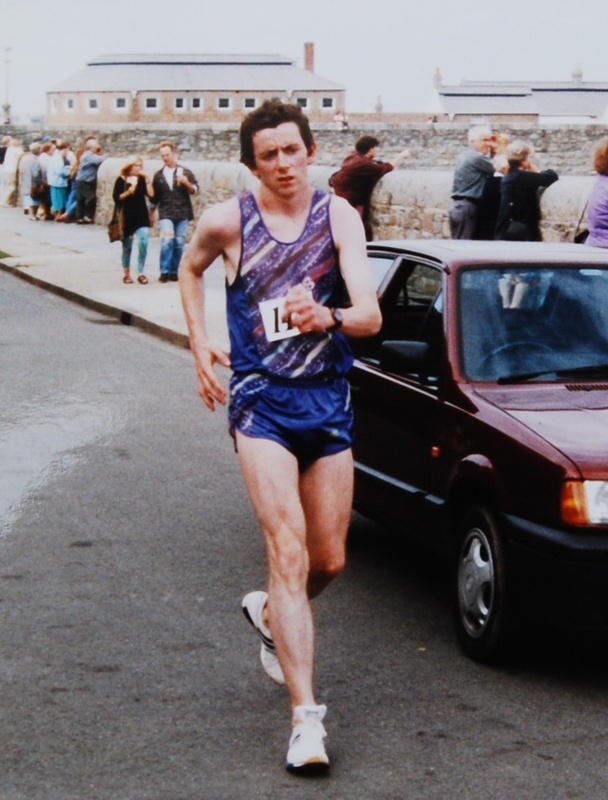 Added to his other wins at 10 miles and 3 kms he also won a local 20 kms walk in 101.44 in 1997, walking in borrowed kit and shoes after his had been lost en route to the island! Never a dull moment with the likeable walkers from Castleisland RWC. Guernseywalker Stuart Le Noury walked to a new personal level in the annual 19.4 miles Church to Church road walk, when he removed over 16 minutes from his previous best time, to come home first in 3.05.54. His usual tactics at this distance are to start of steadily. That tactic went out of the window as he took the race hard from the start, with second and third walkers Jock Waddington and Vinny Lynch from theIsle of Mansteadily falling behind. A third of the way into the race after the hard climb upCornet Streetand onto St Martins Church before taking in the relative flat stretch toTortevalChurchsaw him pass the Church in 58.01. He was two and a half minutes clear of the chasingIsle of Manduo, who were still walking together. Fourth man at this point was local Phil Lockwood in 1.04.14. The leading woman, Marie Jackson, fromIsle of Man, who won the event last year was timed at 1.06.36, closely followed by second woman Cath Duhig from Ryston Runners nineteen seconds behind. Close to them was anotherIsle of Manwalker Sean Hands, who succumbed to injury at 10 miles, with local walker Dean Machon seconds behind, in his first Church Walk. Stuart Le Noury continued to push on hard and after the hills in the upper parishes, hit the 10 mile point in 1.30.01. His advantage was growing and he found himself four and a half minutes clear of second and third place. Marie Jackson was now a minute and a half clear of the second woman in 1.43.22. At 15 miles Stuart Le Noury was visibly slowing and looked in trouble as he passed in 2.15.13, with a sub 3 hours clocking still a possibility. The nearest chasers were still well down and surely out of contention. Le Noury`s previously fluent style was now gone and it would be a slow, hard 4.4 miles trek back to Town from Vale Church and via the Bridge. At Salerie Corner breaking 3 hours was out of the question. A win was still on if he kept himself together as the chasing Isle of Man duo were closing quickly but back some minutes at Admiral Park. Stuart Le Noury took home the coveted Harrods Bank Victory Cup for the first Channel Islander, following in the footsteps of father Kevin Le Noury and brother Jason Le Noury who had won it previously, although they had not managed to actually win the race outright. Not to be left out, mother Jayne has taken the womens equivalent, the Network Insurance Star Trophy and won the event. Fourth man home Phil Lockwood, walked an isolated race in 3.12.51. Marie Jackson walked to first place in the womens event, steadily increasing her lead over Cath Duhig from around 7 miles.Jacksoncrossed the line in 3.21.25, slightly slower than her winning time of 2010. Cath Duhig finished six minutes behind, with the consolation that her course record from 1995 is still intact. The added bonus was a new age best time for the course. Local Dean Machon, in only his third walk and first Church walk, took seventh place overall to take the Network Insurance Newcomers Trophy. Commenting after the walk and the usual “never agains” he said it was the hardest sporting thing he had ever done. Following on was Peter Duhig in 3.47.43, helping himself and wife Cath to the Relate Guernsey Husband and Wife trophy. Regular visitor David Hoben took ninth place in 3.57.51, walking remarkably consistently every time he visits the island. Jayne Le Noury took third place in the womens section, tenth place overall, finishing strides outside the 4 hours barrier to complete the one, two, three in the KPMG Open section of the race, with the added bonus of being the first Channel Islander home. Her walk earned her the Star Trophy and the Jenny Elliott Salver. Husband Kevin, now with 36 church finishes under his belt, who had been walking with Jayne for most of the race, must have been a gentleman as both were credited with 4.00.03, but Jayne was deemed to be enough ahead for it not to be a dead heat! Two new visitors to Guernsey were a few minutes behind, David Delaney from Surrey and John Payn fromLancashire. John Payn was the winner of the Ilford AC Trophy for the first over 70 walker. Heather Tasker, outlasted John Dedman to finish as fourth woman in 4.09.48, taking a massive thirty two minutes off her time of last year. Newcomer to the event, but not to racewalking, was 1956 Olympic walker Eric Hall from Belgrave Harriers, followed by Northern Irelands Norbert Will. Past competitor Eric Horwell, from Dudley & Stourbridge, well down on his best time set many years ago came home in 4.45.51. Guernsey`s Sandra Gee was next to finish in 4.20.30 to win the Guernsey Sports Commissions Womens Newcomers Trophy. 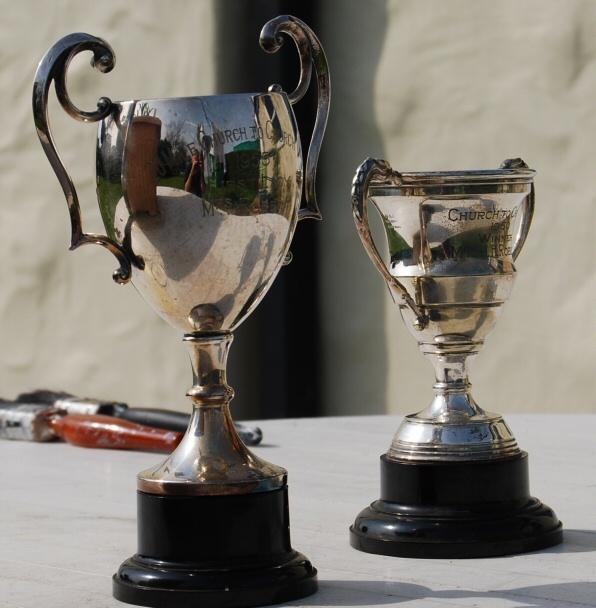 The various age group trophies, sponsored by Taj Mahal, Guernsey Candles, Trust Corporation and Healthspan were won by Jock Waddington (CJ Robin Tankard), Vinny Lynch (Healthspan Tankard) and John Payn (Ilford AC trophy). The Vale Parish took home the Rothschild Parish Shield, with the team of Stuart Le Noury, Phil Lockwood and Jayne Le Noury. The Fletchersports Team Shield went overseas again to the Isle of Man Veteran AC, scoring a win over Sarnia Walking Club. Thanks to all he helped make this event another success and to Electrical Supplies & Machinery Gsy Ltd for the use of the van, a welcome sight for walkers to crash out in at the finish. Following on from the Le Gallez family story in the Church to Church Walk, posted below a few days ago, I have been sent a scan of the certificate given to Ralph Le Gallez in 1949. The organisers in those days were the GIAAC. Since the mid 1960`s the event has been organised by the Sarnia Walking Club. As the island closes in on the 75th anniversary of the Church to Church walk this year its perhaps a good time to look back at some of the early events. A recent request on the http://churchtochurch.wordpress.com/ website about walker Ralph Le Gallez who competed in 1949, led me to some other Le Gallez “family” members involved in the event. It was only discovered by the family that Ralph had walked the race when his 1949 certificate turned up. I often wonder how many other pieces of Church to Church memorabilia are hidden away in attics from those distant days. The most well known Le Gallez was Otto, a hairdresser by trade and regular Church to Church walker between 1937 and 1949. He competed six times in this period, although in 1939 and between 1941 and 1944 there had been no event held. In his first walk, Otto finished in second place to Jerseyman Harold G Taylor.Taylorhad himself finished in second place in the first event held in 1936. Otto`s time of 3 hours 25 minutes was over seven minutes behind that of Taylor, but only 45 seconds up on third man home F W Falla. At his second attempt Otto again finished in second place behind Guernseyman Stan Smith who took the win in 3.19.00 with Otto thirty seconds behind. Third place went to the experienced Taylor who had competed in the much longer London to Brightonwalk in recent times. “After a grim tussle with O Le Gallez, Stanley Smith won the 20 miles Church to Church Walk yesterday”. “After being a minute behind Le Gallez at St Sampsons, Smith sent his cyclist in front to set the pace. Quickening his stride he eventually fought his way past Le Gallez at the Salerie Corner to win by half a minute”. “At the Bridge, St Sampsons, with two miles to go, Le Gallez led by a minute. Then came a sudden change, Smith spurted and was coming up fast as they turned on to the coast. Only forty yards separated them. Le Gallez took a quick glance over his shoulder at the Fruit Export Sheds to see Smith draw abreast of him. Smith forged ahead but Le Gallez made another great effort and was level at Salerie Corner. Here however Le Gallez weakened and Smith slowly drew away. He hit the tape 30 seconds ahead of a very tired and game runner up”. Note: walkers in those days were required to have a cyclist with them. For their efforts winner Smith received the Joybell Trophy, with Le Gallez taking home a canteen of cutlery, of which more will follow later in this story! With no event in 1939 there was a wait until 1940 for Le Gallez to have another shot at victory. 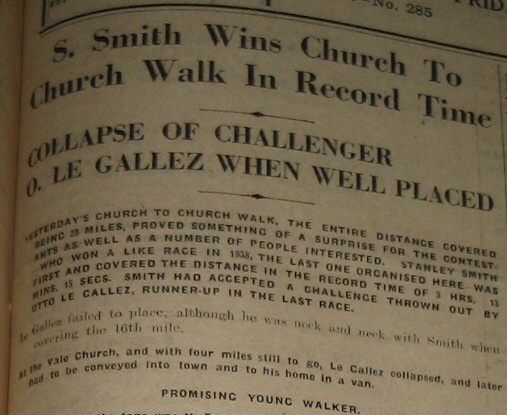 Indeed in the November 29th issue of the Star, it is reported that Smith has accepted the challenge by Otto Le Gallez. On to the walk itself and they are together until the 16th mile where Le Gallez collapses and retires. Photo from Press below. The event resumes in 1945 over a shortened version of the traditional course, around 17 miles, where Otto finishes in third place. He is now in his forties and is beaten by Stan Smith and the young R Le Poidevin. Returning in 1948 he slips to fifth place and a year later finishes in sixth place behind Ralph Le Gallez, his nephew. Otto also walked in the 1945 15 miles walk organised by the “Island Sports Officer” in July 1945. The Garrison organised an event starting and finishing at the Crown Hotel, via the Val des Terres, Fort Road , Grandes Rue, Paysans, towards L`eree, on to the coast and towards Vazon, then inland at Gele Road, Hougette Hill, St Georges, Varendes , Rohais , Grange and back to the Crown. Norman Froome took the honours from Le Gallez, 2 hours 21 to 2 hours 27. It was in this walk that other Le Gallez walkers appeared, with Misses M and H finishing. Since my original notes made years ago I have been told of three Le Gallez sisters, twins Hilda and Maud and other sister Jean. Initials of these names appear in results taken from newspapers below. 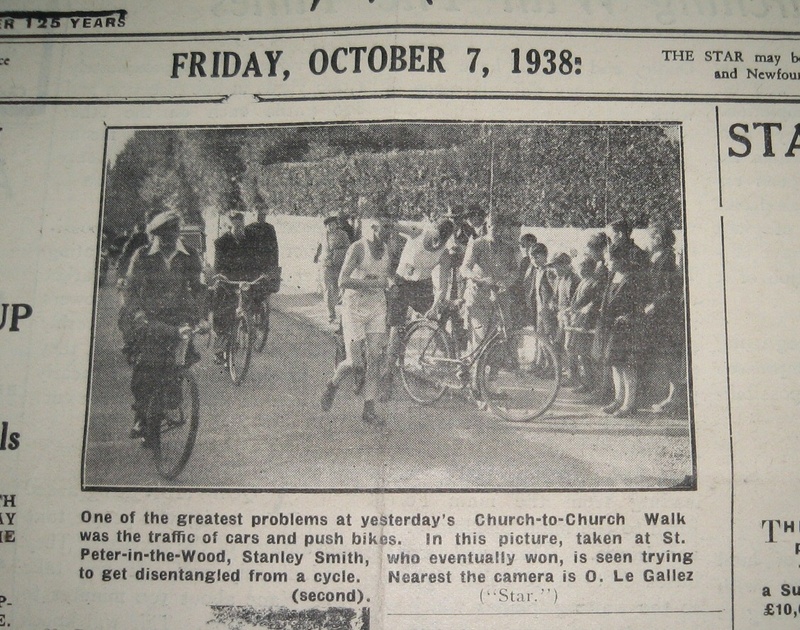 There is a H Le Gallez taking second place in the 1947 Church to Church walk and a J Le Gallez taking second place to J H Robert in 1950 and 1955. It is reported in the newspaper for the 1950 walk that the second lady home was the cousin of the male winner T Le Cheminant. Returning to Otto Le Gallez winning a canteen of cutlery and there is a story in the late George Torode`s 1997 book “Donkeys Ears Apart”, one of a series he did over the years on characters from Guernsey. He recalls getting a call from a nurse at a private nursing home that Otto sends his regards on a previous article and that he would like to meet George. During the afternoon with Otto he was shown a collection of walking race cups and certificates and then asked Otto about the Church to Church story. Otto said he was in his best form ever and during the race was going like a steam train and leading, when 100 yards from the finish went into the Channel for a fag and a pint. Standing by the door he waited for his nearest rival to go past and then carried on fag in hand to the finish for second place. When George asked why he threw away the chance to be champion, Otto replied that it was just after the war and there was nothing much in the shops. His wife had her heart set on a set of cutlery and by coincidence that was the second placed prize in the Church to Church walk. If he had won he would only have had the trophy! Records show that he did indeed win a canteen of cutlery in 1938, but that was before the war. A tall tale or not? A little later on into the 1960`s and an A Le Gallez appears in the Church walk results with times as below. He also competed in the GIAAC 10 miles walk and finished in 83.55. 1945 Church to Church Walk 17 miles apx? July 12 2011. http://churchtochurch.files.wordpress.com/2011/07/le-gallez.pdf for printable version without photos. Sarnia Walking Club member Mick Le Sauvage, himself a stalwart Church to Church Walk competitor, has recently been given two trophies that the late Mrs J H Robert won in 1950 and 1955 for her Church to Church victories. 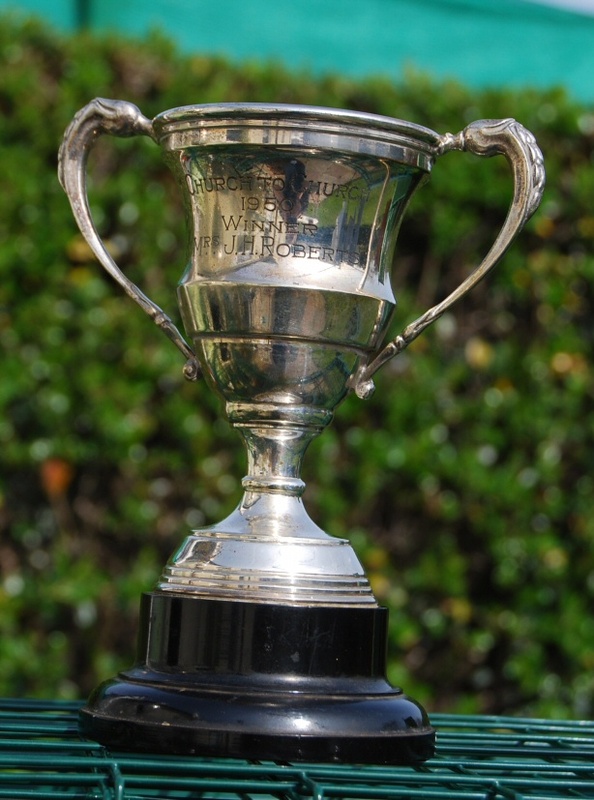 Probably destined not to be seen again, the silver trophies were gratefully accepted for the club archives. Pictured below they stand around six inches tall and were given to her as a permanent memento of her achievement. 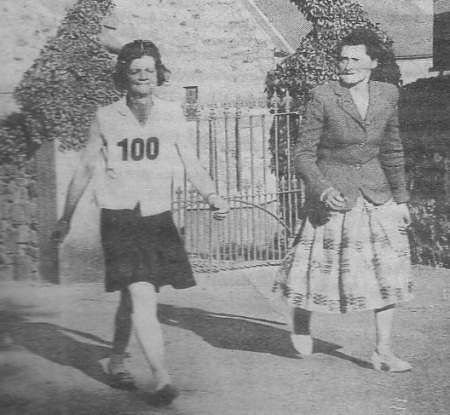 Mrs Robert (100) pictured above at 17 miles encouraged by sister Gladys. Winona Robert or Mrs J H Robert, as she was known as in all the results, walked the Church to Church 19.4 miles walk 19 times, winning ten times. Her first appearance was in 1936 as Miss Peters, finishing as second woman in 3.53.30, then a long gap before she donned her race walking shoes again in 1946. From then on she walked annually until 1964 (except 1956 when there was no race). When not winning, she was usually behind her sister Gladys Leeder, who was another dominant force in the Church to Church with seven wins. 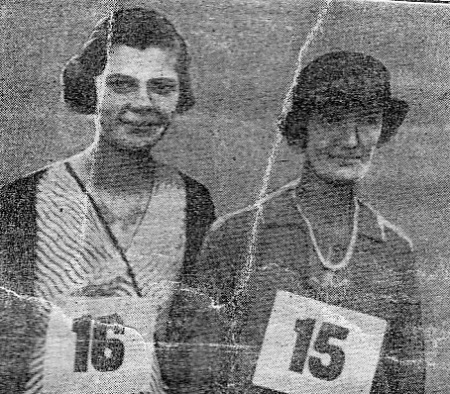 Mrs Robert is still 3rd in the All Time Guernsey Womens lists with her 3.38.11 clocking in 1963, just over a minute behind her sisters best time, with Jenny Tostevin heading the list. On the Allcomers list Mrs Robert is in 6th place, almost fifty years on from her last Church performance. 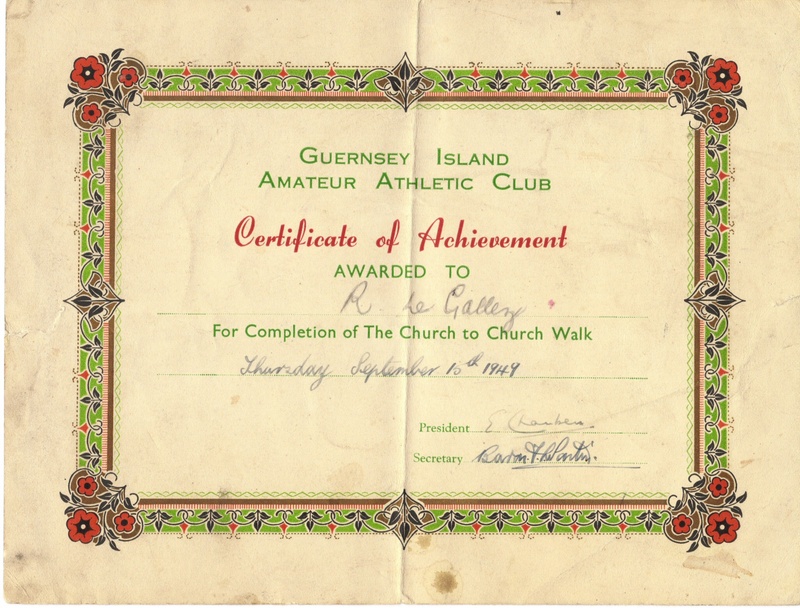 With the formation of the Sarnia Walking Club not until 1965, she, then aged 50 years old, only walked a small number of times outside the Church to Church but still created best times at the following distances in the few walks held in the island. As a founding member of the Sarnia Walking Club, she was made Vice President and became a Life Member for her services to walking. Pictured (16) with her mother in 1936 walk. Mrs J H Robert Church to Church Record.